"I tell stories and can help you tell yours." Rita is an author, editor and writer with more than 25 years of experience. 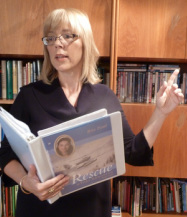 Whether you're a teacher looking for a lively language arts workshop or presentation, or a corporation that needs to communicate clearly with your audience, Rita can help.